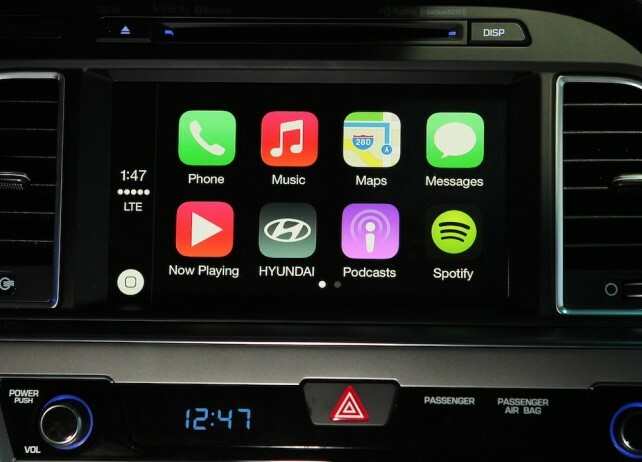 Hyundai has announced Apple CarPlay functionality is coming to the 2015 Sonata. In doing so, the company becomes one of the first volume manufacturers to bring CarPlay to market. Hyundais latest Audio Video Navigation (AVN) systems are already recognized for their beautiful, yet intuitive interface and advanced feature set. Our engineers took advantage of the vivid eight-inch touchscreen to integrate CarPlay for an experience that iPhone users will instantly recognize. A Sonata equipped with CarPlay, lets drivers have the ability to make calls, use Maps, listen to music and access messages. With CarPlay, Siri provides drivers an eyes-free experience by responding to requests through voice commands and can be easily accessed directly through the Voice button on the steering wheel. Using a Lighting connector, CarPlay works with iPhone 5s, iPhone 5c and iPhone 5 running the latest version of iOS 7. This has already been a busy week for CarPlay news. On Tuesday, Pioneer Electronics announced plans to add CarPlay to five of its NEX in-dash multimedia receivers. Alpine is also said to be preparing a CarPlay-compatible receiver for release later this year. Apple CarPlay was first unveiled in 2013, and arrived this past winter with the iOS 7.1 update. The feature will first be available on select car models from Ferrari, Honda, Hyundai, Mercedes-Benz, and Jaguar. Twelve other carmakers have signed on to offer the software in the future, whichpromisesusers a smarter, safer way to use your iPhone in the car.